The Evil DM: This is how I roll! : Mazes & Perils Nominated for an 2013 Ennie Award. Mazes & Perils Nominated for an 2013 Ennie Award. Just a quick update! 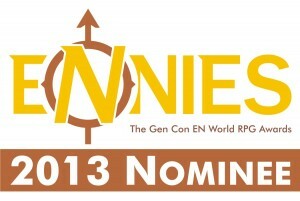 Mazes & Perils has been nominated for “Best Free RPG” in the 2013 Ennie Awards! Thank you to those that have decided to give this little free game a shot at an award. I am glad after working on this product, that it has seen many eyes, and some felt it should be in the running for the best free RPG. Wish it the best of luck, and good luck to the others involved for the voting. Voting starts July 22, 2013, please give it a chance and vote one for the OSR!